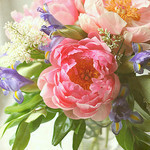 Peonies are probably my favorite of the bunch because of the bright colors they come in. 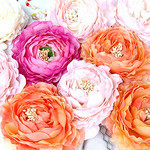 They also look great in a bouquet on their own or mixed in with other bright flowers. If you couldn’t already tell, I love bright colors. 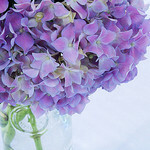 Hydrangeas are perfect for adding a splash of hue into any arrangement. 1. Stick to either 1 color palette with multiple types of flowers, or 1 type of flower in multiple colors. It’s very easy to want to use all of the flowers available to you (trust me, I’ve been there) and there is a fine line between floral arrangement and floral explosion. 2. Geometry is key. Don’t worry if you didn’t pay attention during your high school math class–just eyeball that your arrangement is looking balanced and full. One tip I found helpful has been using 3 flowers to first create a triangular anchor, then filling in the rest with other flowers. Don’t be discouraged if your first bouquets are not Pinterest-worthy. Practice makes perfect! 3. Measure, measure, measure! You’ll want to cut stems so that the tip to end measurement of each flower is 1.5x the height of the vase. 4. Pretty flowers don’t have to be expensive flowers. Trader Joe’s carries seasonal flowers and potted plants at a steal. If you unbundle, cut and arrange these yourself in a vase of your choosing, they’ll instantly look more expensive. If you’re in the San Francisco Bay Area, I would also recommend that you check out the San Francisco Flower Mart, one of the biggest flower marts in the country. Martha Stewart also puts her stamp of approval on it. Well, I think you’re ready to get started now! It doesn’t matter who you’re giving flowers to, they’re an easy and small way to instantly brighten someone’s day.